These days, many Hollywood celebrities are coming up with their own business which is actually good. Some can express their creativity through designing clothes, shoes, bags and more while some are just riding on their names' popularity. In 2006, Beyonce Knowles and her mom Tina opened their Clothing Line named dereon, which is a tribute to Tina's mom Agnez Deréon. The clothing line includes tops, accessories, footwear, outerwear and more and can be purchased at many online stores. Hey there shopaholics, be sure to visit Robinson's mall this August for their All-Out Clearance SALE. Sale is up to 50% on selected items. I love Robinson's most especially their Robinson's Galleria branch as I frequent there. 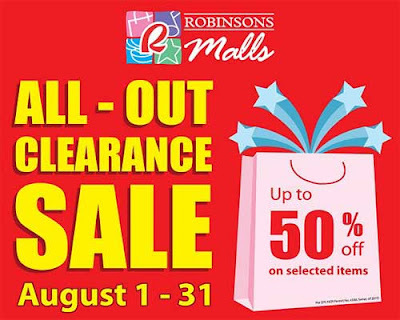 Now that they have a SALE this August so for sure, I will not miss this great opportunity to knock out some great deals on clothes, shoes, electronics, toys, and lots more. I'm planning to go this weekend to buy a pair of jeans and a new shoes. I also hope to find a door knob at the hardware section. If I can't find one there, I'll drop by the nearest home depot as well. Yay, I'm excited already! !